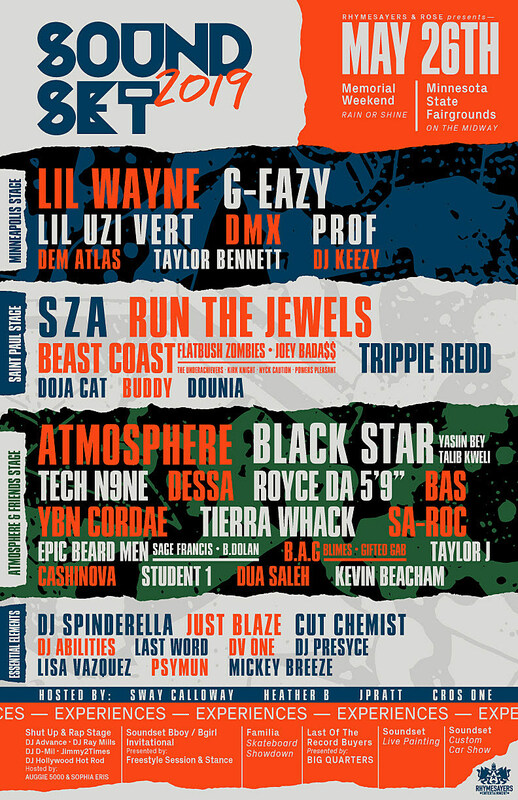 Rhymesayers‘ annual Minneapolis rap festival Soundset returns May 26 to the Minnesota State Fairgrounds, and the 2019 lineup is pretty stacked. As usual, Atmosphere is one of the headliners, and the other headliners include SZA, Run The Jewels, Black Star (aka Talib Kweli & Mos Def), Lil Wayne, and G-Eazy. The lineup also includes Lil Uzi Vert, DMX, Beast Coast (aka Flatbush Zombies, Joey Bada$$, The Underachievers, Kirk Knight, Nyck Caution & Power Pleasant), Tech N9ne, Dessa, Royce Da 5’9″, Bas, YBN Cordae, Tierra Whack, Doja Cat, Buddy, Trippie Red, Taylor Bennett, B.A.G. (aka Blimes & Gifted Gab), Epic Beard Men (aka Sage Francis & B. Dolan), Just Blaze, Cut Chemist, and more.